A good view of Pomona's Turn 3 and the famous "bridge"
Joe leads motorcycle racer John McLaughlin in a Cooper Formula II car. They collided coming out of turn three on the last lap. This race was run on February 1, 1959. "While Joe and John were crashing Bob Drake got by to win. The starter was so surprised he didn't give him the checkered flag." "I spoke to Joe Playan and he said he finished 3rd in that race at Pomona. John didn't get going again after the collision and didn't finish. 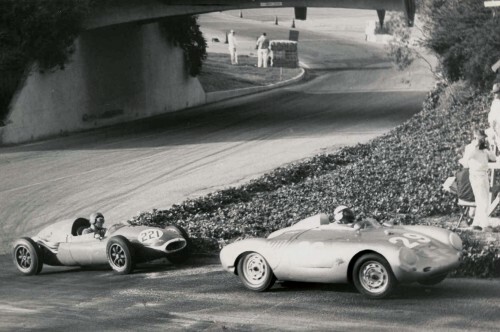 Bob Drake and Skip Conklin in a Lotus Mk.XI got by Joe. A fellow in a Porsche had spun in front of John and John spun to avoid him. Then Joe came up and kind of pinned him. Joe backed up and got away and finished 3rd."